Laparoscopic surgery during pregnancy for the management of both obstetrical and nonobstetrical disease is being performed with increasing frequency. Numerous clinical reports have demonstrated that pregnant patients may undergo laparoscopic surgery safely in any trimester without an increase in maternal or fetal morbidity or mortality compared with open surgery. A review of the Swedish Health Registry from 1973 to 1993, which included pregnant women who had undergone nonobstetric operations between weeks 4 and 20 of pregnancy, compared 2233 laparoscopic procedures to 2491 open procedures and found no significant differences in birth weight, gestational duration, intrauterine growth restriction, infant death, or fetal malformation (11). A nationwide, multicenter, retrospective survey was carried out in Israel, that included all of the operations performed on pregnant women from 1990 to 2000. One hundred and ninety-two laparoscopies (first trimester 141, second trimester 46, third trimester 5) and 197 laparotomies (first trimester 63, second trimester 110, third trimester 24) were performed. Surgical procedures were performed for adnexal disease, appendicitis, cholecystitis, heterotopic pregnancy, Crohn's colitis (hemicolectomy), and bowel obstruction. No statistically significant differences were observed between laparoscopy and laparotomy in the prevalence of abortion, preterm labor, preterm delivery, intrauterine growth restriction, or fetal anomalies. Furthermore, immediate postoperative complications were lower in the laparoscopy group, including fever, pulmonary embolus, and premature contractions (70). Short-term outcomes following laparoscopic surgery during pregnancy have been almost uniformly good. However, there is a paucity of data evaluating the long-term effects on the resultant children. To this end, a recent study was conducted that followed, from one to eight years, the children of 11 patients who underwent laparoscopy in their 16-28th weeks of pregnancy. 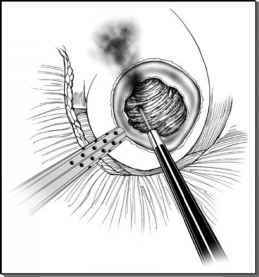 Laparoscopic procedures included appendectomy, cholecystectomy, and lysis of adhesions. No delay in growth or development was experienced by the children (71).